Mario Tennis Aces is slamming into Switches everywhere this weekend, so I think it’s time for us to get video games ready for summer sports. I’m not really a “sports and shorts” kind of guy, but it’s hard to deny that it feels great to go outside and throw some sort of ball object around with your friends. Maybe you can hit that object with a bat of a racket. The freedom of sports is that you can do whatever you want! There’s no rules! Hold on, I’m getting some info that I might not understand sports. In any case, I bet that you understand sports, and that’s all that matters. For this week’s ‘Shop Contest, I want you to get your favorite characters in the mood for summer sports. As you can see in the image I have created above, Batman has found a plucky plumber’s racket on a dark Gotham roof. How did it get there? Does Cappy think Batman murdered Mario? 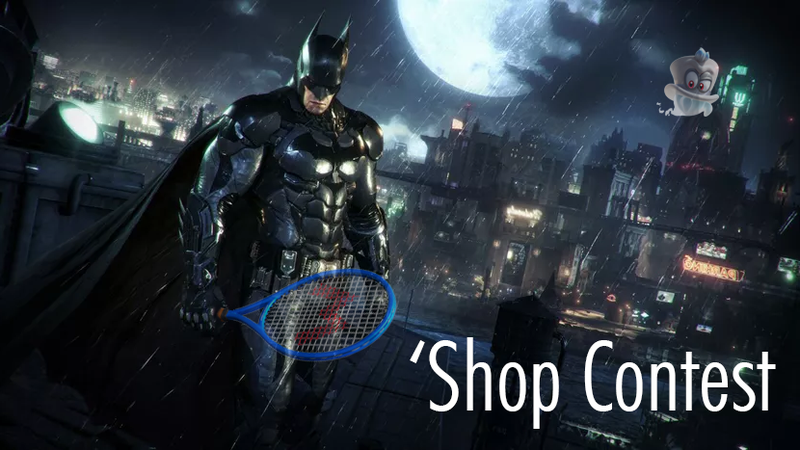 It’s impossible to know, but it’s a live option, and Batman might have broken his one rule just to feel the fun of knocking a little green ball back and forth with his best friends. Your task this week is to use your favorite image editing software to get the summer sports in the games where they don’t belong. Bonus points for any and all references to the volleyball scene from Top Gun (which, canonically, has the best Kenny Loggins song on that soundtrack. “Playing With The Boys” is a better song than “Danger Zone.” I’m sorry to drop this truth bomb on you during a ‘Shop Contest). As always, good luck, and the rest of the instructions are below.